Summer is finally winding down. And while I'm probably more excited than I should be that Fall is coming and that I get to go back to school (ask me in a month and a half, and I certainly won't be quite this thrilled to be at school), there is one thing I'm definitely going to miss. Ice cream. Now I know you can eat ice cream any time of year really, but it's just not the same. 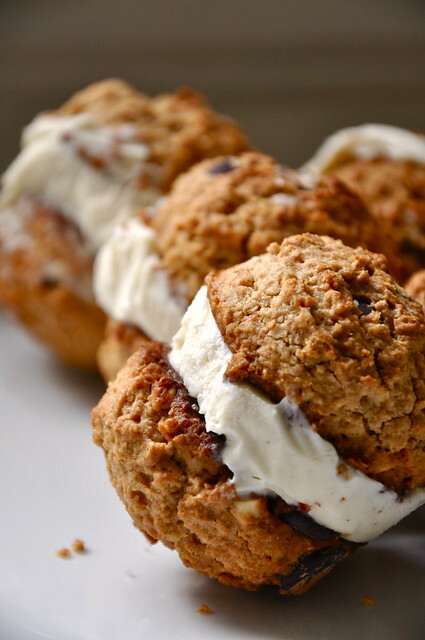 So in a final salute to the warmer months, I have ice cream sandwiches for you. Don't get me wrong, I think the good old store-bought ice cream sandwiches with the chocolate wafer sandwich really can't be beat. It's so hard to improve upon a classic, so I was happy these went in a slightly different direction. Almost whoopie pie-like, these sandwiches are a nice balance of sweet and salty, cakey and smooth. There's a greater cookie-to-ice cream ratio in these than in traditional ice cream sandwiches, but that's ok. The cookies are so good on their own, that I'm sure no one will complain. 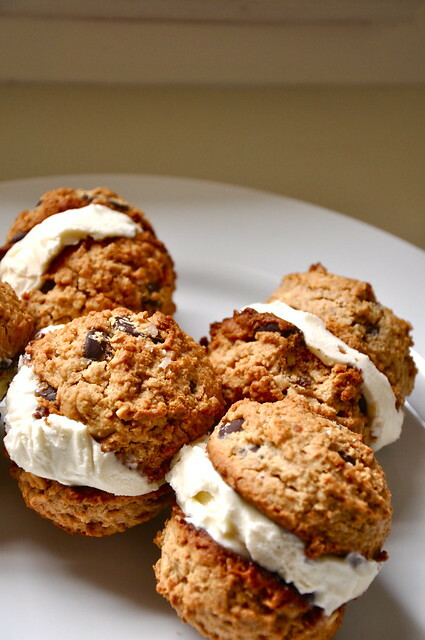 The oats add a nice heft to the cookies, and there are just enough chocolate chips to keep things interesting. So, for nine months, I will say farewell to the ice cream sandwiches of summer, ready to hunker down with gingerbread cookies and hot chocolate for a little while. Preheat oven to 350 degrees. Line two baking sheets with parchment paper. In a small bowl, whisk together oat flour, salt, and baking powder. In the bowl of a stand mixer, beat butter and sugars together until light and fluffy, about 2 minutes. Add egg and beat to incorporate. Add honey and peanut butter and beat until smooth and fully combined. Beat in dry ingredients. Fold in oats and chocolate chips. Using a small ice cream scoop, drop scoops of dough onto lined baking sheets. Sprinkle Fleur de sel on top of cookies. Place baking sheets in oven and bake for 15 minutes, until lightly browned and dry on top. Remove to a wire rack to cool. 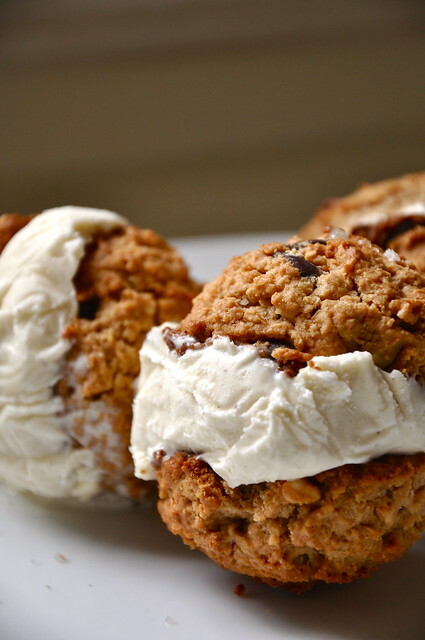 Once cookies have cooled completely, scoop vanilla ice cream onto one cookie and sandwich with another. Repeat with remaining cookies. Wrap each sandwich in plastic wrap and freeze until ready to eat. Remove from freezer 5 minutes before eating. 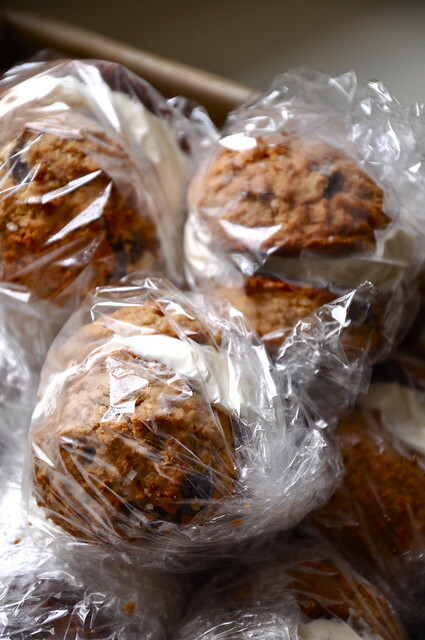 I made chipwiches this past weekend, but wasn't sure how to store them. Plastic wrap, DUH!